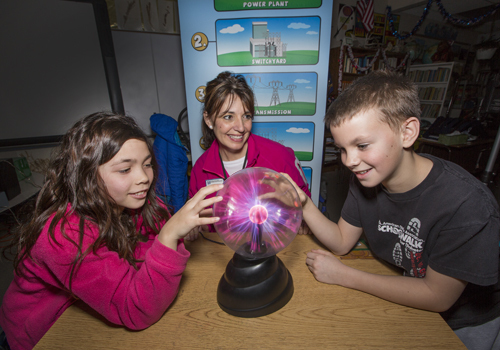 A highlight: the plasma ball, according to Kimberly Kranz, Basin Electric’s demonstration coordinator (center). Also pictured: Riley Lembke and Mason Kindel, students at Centennial Elementary in Bismarck, ND. Walk into a classroom today and you will find students reading books on tablets, punching in answers to their teacher’s questions on clickers that look like television remote controls, and drawing on interactive whiteboards. No longer are the days of books, paper, and chalkboards in school. Technology has changed the way educators are teaching, students are learning, and the way teachers and students are communicating. Basin Electric recognizes the impact technology is having in the classroom and was motivated to update their own educational program called The Story Behind the Switch. The program’s most recent updates include entirely new graphics, a 45-inch flat screen television, PowerPoint slideshow, and two very key new characters, Basin Brittany and Electric Eric. Read more about the new and improved program and find out how the students are responding to it in the September-October issue of Basin Today.